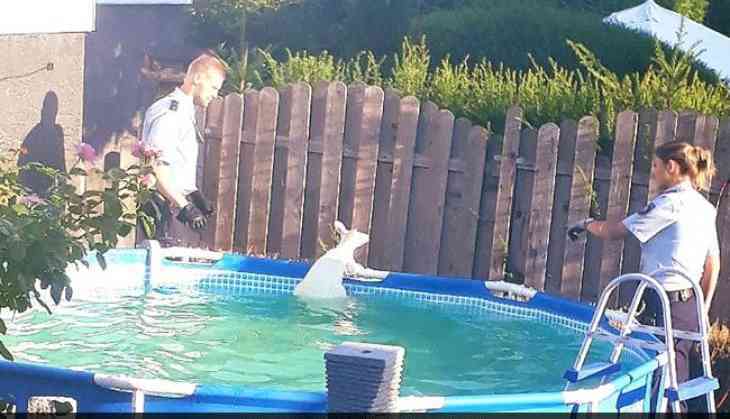 A white Kangaroo escaped, and it led police on a chase around a residential neighborhood and jumped into a family's pool before it was caught. According to the Rhine-Westphalia Police, cops were called to a Dortmund neighborhood in Germany after reports of a kangaroo running loose. The white kangaroo escaped from its owner's property after one of its roommates, a goat, used its head to break through a fence. It then proceeded to lead authorities on a wild goose chase, hopping through gardens and evading all attempts to capture it, even trying to kick an officer in the head, before finally jumping into a pool. Police was then able to grab it and return it to its enclosure. The incident took place last week and the police shared pictures of the chase in a viral Facebook post. One of the pictures shared shows the kangaroo hiding behind a car before it jumped into the pool. The kangaroo's exploits went viral on Facebook, collecting over 500 'shares' and thousands of 'laughing face' emojis. Luckily, the police report that no one was hurt during the rescue operation, but the pool did suffer some damage. READ NEXT >> Mira will never let Shahid go!